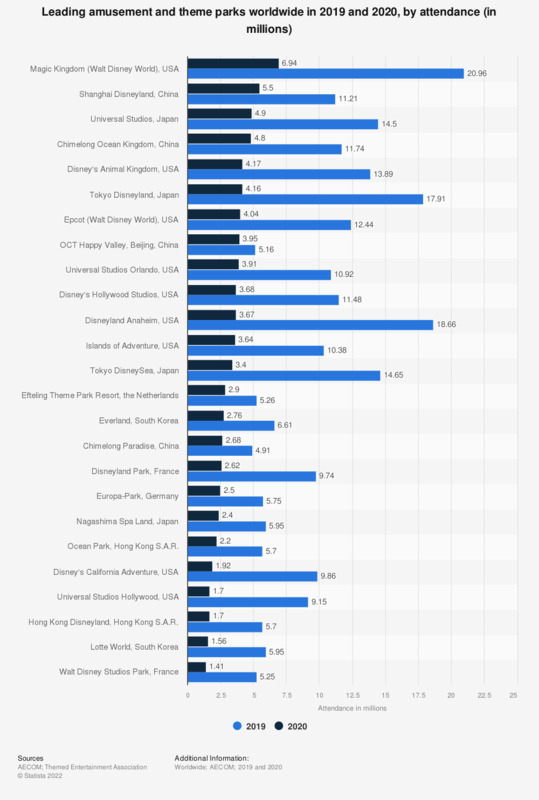 This graph depicts the attendance for the 25 most visited theme and amusement parks worldwide in 2017. Magic Kingdom (Walt Disney World) in the United States was visited by 20.45 million people in 2017. Spending time at amusement parks is a popular leisure activity among people all over the world, particularly families with children. The world’s leading theme park companies include Walt Disney Attractions, Universal Studios Theme Parks and Merlin Entertainment. In North America, most popular amusement parks report increasing visitor numbers each year. However, visitor numbers to SeaWorld parks have decreased in recent years. The decline in visitor numbers may have been caused by negative media attention drawn to the parks’ controversial use of captive killer whales. Following a number of park employee deaths caused by the captive whales, trainers were banned from coming into close contact with the animals during shows. Amusement parks are not the only type of park visited by people during their leisure time. Those seeking to avoid the busy amusement parks and scary rollercoaster rides might instead choose the tranquil beauty of national parks. In the U.S., one of the most visited national parks is the Great Smoky Mountains National Park with around ten million visitors per year. City parks are also popular in the U.S. The most visited city park, Central Park in New York, is also one of the most visited tourist attractions worldwide.